Curb-stomp enough Grubs in the main storyline, and you'll be treated to another series of events featuring Baird and Cole. Gears of War: Judgment is yet to be released to the masses, but it looks like that there's already some unlockable content ready for players who complete the single-player campaign with enough style points. The "Aftermath" campaign is included in the upcoming title, and it reveals Baird and Cole's journey in the closing moments of Gears of War 3. Gaining access to the campaign won't be quite as easy as handing over your credit card details, though. Players will need to unlock stars in Judgment's core campaign, which are awarded for actions such as pulling off enough head shots, performing executions, and completing levels without needing to be revived. You can earn stars at a faster rate if you choose to complete "Declassified" missions, which are harder versions of the standard "Classified" challenges. 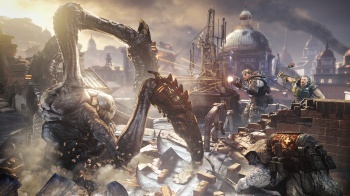 Epic's lead level designer Jim Brown stated that the team wanted to produce something that added context to the game and also tied the events back to the main trilogy. "So you'll see when you go in there some people you recognize, some places, maybe even some enemies and then see how the two storylines weave together in the context of the whole franchise. "Obviously we don't want to give away too many spoilers in how it's going to end or what you're going to see," he continues. "But the basic gist of it is that when they're at the fort, Marcus sends Baird and Cole off to find supplies and reinforcements, and then he goes off to Azura. Then at the very end they show up with helicopters. This (Aftermath) is where they went and what they did on that mission." It appears that Aftermath will only last for a couple of hours, but it looks like a pretty neat incentive to give the campaign another shot. Gears of War: Judgment is set for release on March 19th.